Grant McKay, what to do? 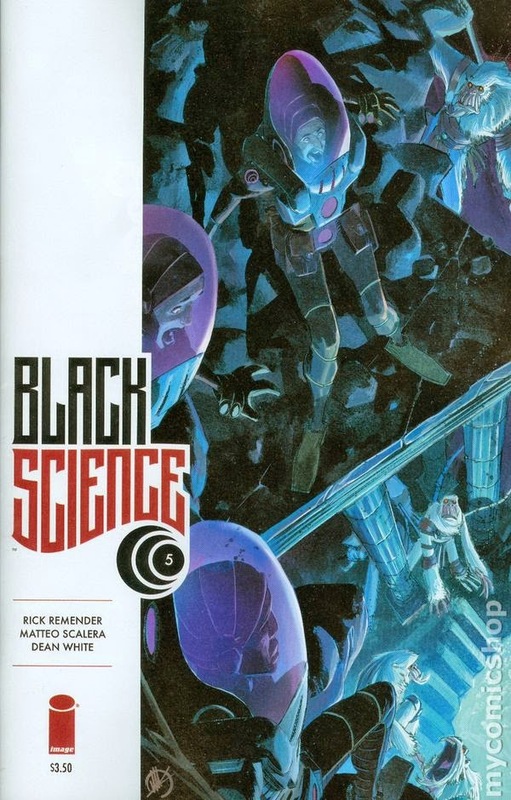 Black Science #5 - Written by Rick Remender, illustrated by Matteo Scalera, colored by Dean White, lettered and designed by Rus Wooton, edited by Sebastian Girner, published by Image Comics. I was blown away by the first issue of this tremendous series. Within the first panel or two you were caught up in a whirlwind of action, gaining background bits and pieces of the characters and story as we followed Grant McCay through a strange and deadly world of amphibian creatures. Issues two through four found our “heroes” of the Anarchist League of Scientists trapped in a world of techno Native Americans, fighting the under-equipped Germans; those issues were also a heck of a good read. Characters were killed, Grant almost died, we had treachery, desperation, a literal ticking clock, and the curiosity of the unknown to carry us forward. Now with this issue, we take one quick breath as the whirlwind that is Black Science kicks up once again. Some love the anarchist scientist Grant McKay. Others hate him. Ask Grant McKay what he loves and he will answer without hesitation…science…errrrr, his kids. Yes, definitely his kids, which is the truth, but science is an incredibly close second. As Grant and his crew take a moment to relax and prepare for their next involuntary jump to an unknown world, the mysterious costumed stranger makes his appearance known by snatching Grant's kids. Rushing against the clock before the next world jump, Grant gives chase to retrieve his kids, even at risk of becoming stranded on the current parallel world. He also learns a tidbit of information that won't make him happy. No doubt about it, this series is a blast. One moment you think you know what's going to happen, but then the creators do something completely unexpected. Is there any better indication of how enjoyable a comic is than reaching the final panel on each right facing page and muttering, “Oh man, what's gonna happen next?” It also doesn't hurt to have cool characters (a couple of whom have already died for Pete's sake), an awesome premise, and a story that can go anywhere. Throw in Scalera’s beautiful sequentials, his intense action scenes, a three-headed robotic bird thing, and White’s gorgeously insane coloring palette and there’s plenty to love about this book. Just have a look at the page with the amorous alien couple getting “Blazzatted” in their parked beetle thing, or the final two-page spread of the next world with its lush blues and you will completely understand just how well Scalera and White’s art looks together. I am more amped than ever for the next issue. This is a must read book, denizens. There is far too much going on to adequately describe all the intricacies of the story…you just need to read it. If you haven't yet picked up the series or you can't find the multiple reprints of the first couple issues, you are in luck. Amazon.com slates the $9.99 retail trade as being available on June 10, and is listed as having 152 pages, which I believe will cover issues 1–5; each issue is longer than your average comic book. So, I guess what I'm saying is you need to be reading this sci-fi adventure that will remind you with every issue just how great it is to be a comic book fan. VERY HIGHLY RECOMMENDED! 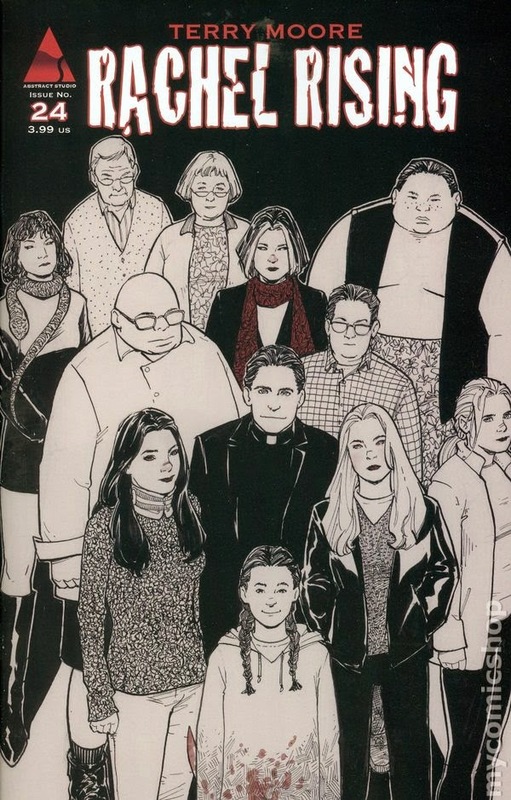 Rachel Rising #24 - Everthinged by Terry Moore, published by Abstract Studio. I have loved every page of this series since it first started, and it only continues to get better and better with each issue as we learn more about what happened with/to Rachel/Bryn Erin, Lilith, and the town of Manson. The series is a mixture of the Twin Peaks television show, the creepier stories from The Twilight Zone, and a crime drama, all while maintaining the feel of a Terry Moore work (Strangers In Paradise, Echo…each a must-own series in its own right). The first story arc comes to a conclusion as Rachel/Bryn Erin, James (trapped in Jet's body), and the murderous Zoe face down Lilith, the witch who wishes to destroy the town of Manson once and for all after the hangings of 100 supposed “witches” from over a century ago. It is an eerie scene as 97 bodies hang by the neck, suspended in the nothingness, both as testament to what happened and as a distraction. But where are the other three bodies? It's witches, wolves, snakes, killers, and the dead risen as this chapter comes to an exciting conclusion. <puff> <pah> That's the sound of me “smoking” my candy cigarette and taking a sip of rye after reading this darn-fine issue. Moore satisfactorily answers many questions with this first-chapter conclusion, all while leaving plenty of situations looming for the next story arc; namely, the identity of who killed Rachel in the first place. Moore gives his all in this issue (doesn't he always? ): some truly bone-rattling scenes of horror—the hanged women screaming <brrrrrr>; clever quips from Zoe that made me laugh between my nervousness; intense action; gruesome scenes of vengeance; a bone-chilling fate for the villain; and so much more. This is just considering the elements of the story. The art is some of Moore's best work to date. The sense of scope as Rachel/Bryn, James/Jet, and Zoe stare up at the night’s sky as the snow falls all around them in the opening silent panel is utterly haunting. The character acting is phenomenal, and the action as sharp as Zoe’s knife, Jack. Whether we see the reactions to a couple of wolves charging down a hill, a snake springing from someone’s mouth, or one person admonishing another who said something truly awful, you know exactly what each person is feeling…you can't help but feel it, too. Again, all of this happens during a tremendous snowstorm, and Moore refuses to let the intensity subside, until that moment the snow finally stops. Most important of all, Moore has me so excited for the second arc, that I want to reread all 24 issues so I can experience this series again to better prepared myself what comes next; it's also just a joy to read. If you haven't been following this must-read series, then you can buy the first three trades easy enough—I'm sure the fourth is on the horizon, and it wouldn't surprise me to see a compendium of some sort before the end of the year. Beautiful to read, beautiful to look at, I can't wait to see what happens next as we continue our search for Rachel’s killer. Oh man! What about Aunt Johnny!!! VERY HIGHLY RECOMMENDED! 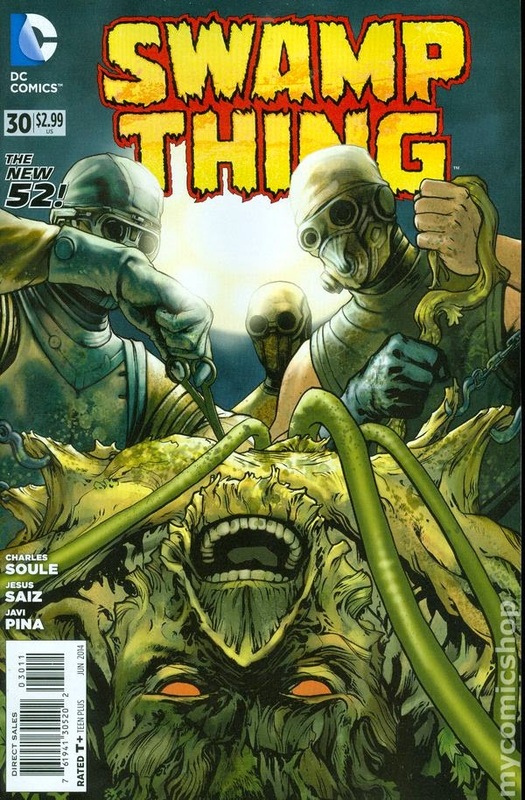 Swamp Thing #30 - Written by Charles Soule, illustrated by Jesus Saiz, finishes on various pages by Javi Pina, colored by Matthew Wilson, lettered by Travis Lanham, published by DC Comics. Dang, denizens, I thought it was a really bad idea for the Swamp Thing (Alec Holland) to give up his Avatar status to those “Serene” hippies who showed up out-of the blue, all so Alec could once again, for a brief period, walk in a man’s shoes. To be honest, I thought it was kind of dumb on his part, but then I started thinking—you know what happens when I start doing that—he failed to realize just how much he missed being human. To quote the rock band Cinderella, "You don’t know what you got till it’s gone," which is the case with Alec. His desperate attempt to reclaim what he lost, even if just for a moment, might very well be his doom. The body of the Avatar is long gone from the bayou, and is in the corrupt hands of an evil corporation. Speaking of bodies…the Lady Weeds is sporting some new ink as she and the Wolf continue their scheming after Alec had changed them from former Avatars into humans. But when they, Brother Jonah and Capucine find Alec in a human body and near death after the fake Serene members poisoned him, Capucine calls on a surprise friend of hers from way way way back. Armed with new information, Alec and Capucine travel to Italy to find the Serene, but what they find there is shocking, especially when it comes to what the mysterious Miki has to say. This issue is highly enjoyable as all the characters involved play their games to achieve their goals, but it is the final four-panel page that leaves me desperate to see what happens next. I really want to spoil what is going on with this girl, Miki, but I'm going to bite my tongue and commend Soule on taking these Serene characters and their abilities to places I never suspected, and opened the story to some interesting possibilities. The art is beautiful as ever and Wilson's colors are perfect for this title which was the New 52 book I was most excited to read, and the one that continues to be one of my current favorites. Definitely a book to watch. HIGHLY RECOMMENDED! Pretty Deadly #5 - Written by Kelly Sue DeConnick, illustrated by Emma Rios, colored by Jordie Bellaire, lettered by Clayton Cowles, edited by Sigrid Ellis, published by Image Comics. The first chapter of Pretty Deadly comes to a close as we join Bones Bunny and Butterfly as they continue the tale of Ginny (Death's daughter), Sissy (the vulture girl with the mismatched eyes), Johnny (the “coward”), Fox (Sissy's guardian), Sarah, and Molly the raven as they attempt venture into Death's domain. Death's time has come and Sissy is slated to take his place…so long as Death doesn't kill them all first. First, they must get past Big Alice and the Shield Maids. It's daughter against father in this exciting conclusion. If you have not been reading this series, then I suppose the first two sentences are going to leave you scratching your head as to what the heck I'm talking about. That said, if you've read the book—and you're like me—then you were probably still scratching your head until you took a hit of coffee, thunkeded your brain stuffs real hard, and reread the book until you got what was going on. That's okay. We don't need to be spoon fed every detail of what is transpiring. 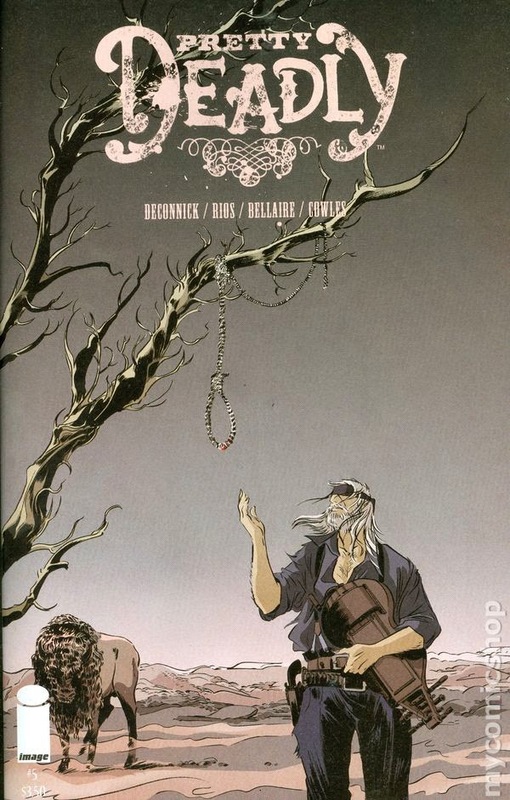 DeConnick and Rios have crafted a highly intelligent, beautifully written, and elegantly illustrated fairytale of the West whose past five issues were heavy, yet rewarding for those who stuck through to the end. With the last few pages leaving me questioning whether or not the series would continue, I was more than pleased to see the final caption “Deathface Ginny will return in Pretty Deadly Volume 2.” The story can go anywhere from here on out, but if one thing is for certain, I know I will be there for each precious word that is to come. The first trade will release in mid-May if you missed this series the first time around, and it will retail for the very low price of $9.99. HIGHLY RECOMMENDED! Now This Is Just Getting Stupid—Still no @#$% The Sixth Gun or Undertow. Dang, denizens, I tell you, by the time I get March’s issues, April’s issue will be coming out. Of course, the brighter side of this is that I can read two issues of these series back-to-back and that's kind of cool. Still, I hate having to wait. Another plus is that I think I only have East of West in my pull next week, so if I get both books next Wednesday, the timing will be perfect for FSoH/SitW. Speaking of the next post, I might just have to pull out a trade or two to talk about next week as well. We'll see. Anyhow, go on now…git…go make ol’ Donist proud and see some Captain America: Winter Soldier.